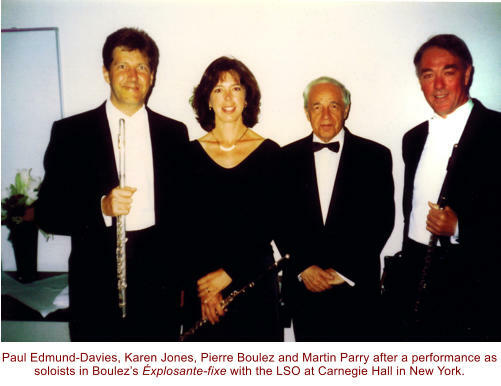 Karen Jones has had a career that anyone would call glittering: BBC Young Musician of the Year woodwind finalist in 1982; gold medallist at the Shell-LSO Scholarship in 1985; first flute in the European Community Youth Orchestra; Fulbright Scholarship and Harkness Fellowship to study in New York; first flute in the Bournemouth Symphony Orchestra at the age of twenty-two; and she is now one of the leading freelance players in London and a professor at the Royal Academy of Music, and all this at the same time as having a successful marriage and bringing up two children. And she’s lovely with it. You might almost be tempted to say it’s unfair. Karen comes from a long line of successful musicians. Her great-grandmother was the harpist Winifred Cockerill, one of the first women to play in any of the London symphony orchestras, and who was herself the daughter of a musician. Her grandfather, Tom Jones, was a violinist in the Palm Court Orchestra, Eastbourne, and later in the LPO and the RPO. Her father, Martyn Jones, was co- leader of the Bournemouth Symphony Orchestra before moving to London to play in the Philharmonia, of which he became the chairman, and her mother Barbara Murray was the accompanist at the Yehudi Menuhin School and has just retired as the accompanist at Wells Cathedral School. Her uncle Michael Jones played in the Amici String Quartet after playing in the Philharmonia and leading the Northern Sinfonia. Hers is a very musical family. Karen lived in Bournemouth from the age of seven until she was ten. She took up the flute and was taught by Alan Melly—such is her regard for him she insists that I call him the wonderful Alan Melly—before moving to London where she had lessons for a short time with Trevor Wye. She was then sent to St. Paul’s Girls’ School where her teacher was Alexa Turpin, before going on to Peter Lloyd. It was as a student of Peter Lloyd that she had her first success in the BBC competition, and she went on to the Guildhall School of Music to continue her studies with him. ‘Peter made me well aware of the fact that my embouchure was a disaster. It was so off-to-one- side. My dream was always to play principal flute in an orchestra—I didn’t want to play concertos and be a soloist—and he knew there was a control I was going to need in the pianissimos and he suspected I wasn’t going to manage it in the way I was working. He wanted me to take however many months, or even a year—he couldn’t tell me how long—in order to fix it. Peter’s top priority was tone, colour and control. I still think those are the most important. I wanted to be a sweet-sounding principal flute, with a beautiful sound soaring over the orchestral textures.’ At the end of her time at the Guildhall, Peter Lloyd suggested to Karen that she stretch her wings and study abroad. ‘Go somewhere where they don’t play the flute like us,’ he said. Karen had been to Vienna with the ECYO and had loved it—she had been caught up in the romance of Gustav Klimt and Egon Schiele, so after spending the summer at the Banff summer school in the Canadian Rockies, where she studied with Thomas Nyfenger, she set off for Vienna to study with Wolfgang Schulz. Vienna was not a success: Wolfgang Schulz was busy and often sent a deputy to do his teaching, and, besides, Karen missed the boyfriend she had met in Banff. After half a year she changed her scholarships and moved to New York, where the boyfriend was waiting for her, and where she studied with Thomas Nyfenger for a year and a half. ‘Tom was magic,’ she says. ‘Whatever you played in Tom’s lessons, from Stravinsky orchestral excerpts to Jeanjean études and all the rest of it, Tom would harmonise on the piano to illustrate why certain notes warranted certain colours and certain cadences warranted shaping in certain ways. I had never come across anything like that—it was the sheer intelligence of it. Also, I loved his approach: he told his students everything just once. If they took no notice, well, tough, he wasn’t going to tell them again. 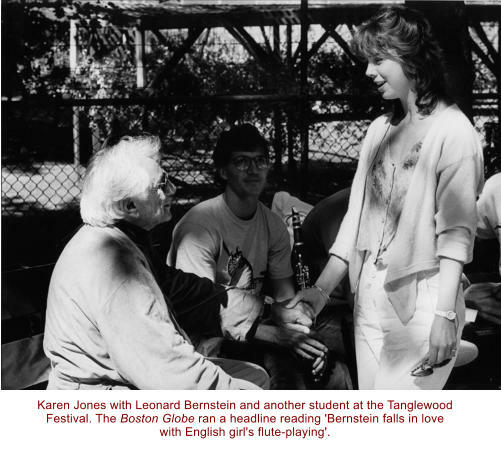 It was up to us to do with it as we will.’ While studying in New York Karen was twice invited to participate in the Tanglewood Festival where Leonard Bernstein heard her play. 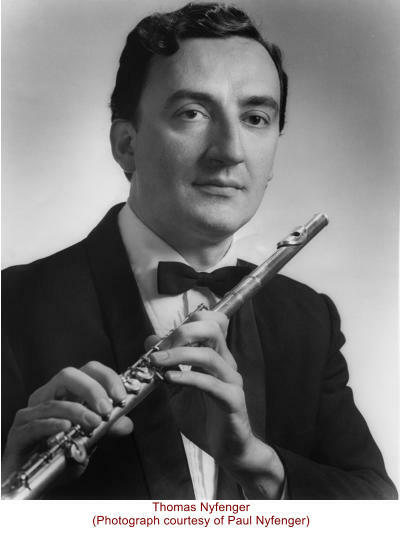 After one performance with him of Hindemith’s Mathis der Maler, the Boston Globe headlined its review ‘Bernstein falls in love with English girl’s flute- playing’. One of Karen’s fellow students in New York was Marco Granados. ‘When we weren’t practising we were busting our guts playing flute duets and as a duo we attracted much work entertaining people such as Mayor Koch.’ Then, while Karen was still aged twenty-two, the Bournemouth Symphony Orchestra invited her for a trial for the first flute job. She flew over and started at the deep end. ‘My very first notes on trial were the opening solo in Delius’s Brigg Fair, in a recording session with the late Richard Hickox conducting.’ The orchestra offered her the job, but she turned them down. ‘How arrogant was that?’ she asks, in amazement at her youthful folly. She returned to New York for a further year’s study, at the end of which the BSO job was still available to her, so she decided to take the job after all. ‘It was the right thing,’ she says, ‘because when I was there I met my husband, Andrew Barclay.’ She had five years in the orchestra before deciding to pursue her already growing freelance career in London. Andy, her husband, took a job in the LPO, and they moved to London. They have been there fifteen years, and Karen says she is busier than ever. How do family pressures affect her career? ‘It comes at a price,’ says Karen. ‘At St. Paul’s Girls’ School it was impressed on us that you can have it all if you work hard enough. I still want it all, and I do have it all, but I’m exhausted!’ She and Andy are lucky to have a wonderful lady to look after their two children. She has been with them for fifteen years and is the children’s third parent. In an attempt to balance family and career, Karen gave up touring for a long time, and if she thought she was working too hard she would give up working at weekends. ‘Not everyone is so lucky,’ she says. How has Karen’s career developed? ‘I now regularly play as guest first flute in all the London orchestras,’ she says, ‘and I am doing a lot of film sessions as well as being principal flute in the City of London Sinfonia and the London Chamber Orchestra.’ The sessions fit well with my family life as they are usually during the day and always in London, and don’t require touring. Does she enjoy this commercial work? ‘I adore sight-reading on the red light,’ she says. ‘There’s no time to get screwed up—you just get it right.’ Among many other films, Karen has played on all but one of the Harry Potter soundtracks. She is the one who played the virtuoso solo in Harry Potter and the Prisoner of Azkaban. (It seems odd to think that of all the work she has done that is the piece that will have had the biggest audience.) More recently she has been doing a lot of playing in the London Sinfonietta, which, of course, specialises in newer music. ‘I love it,’ she says. ‘It takes me out of my comfort zone and keeps me on my toes.’ As a teacher, Karen started at Trinity College of Music in London, then took a job at the Royal Northern College of Music in Manchester. ‘They were very accommodating,’ she says. ‘I taught for two days every two weeks, but I gave it up because I couldn’t bear to be away from the children even for one night a fortnight.’ She then became a consultant at the Welsh College of Music and Drama in Cardiff and at the Birmingham Conservatoire. 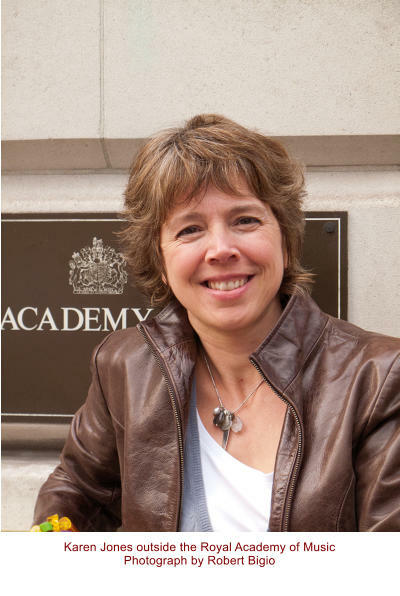 She is now professor of flute at the Royal Academy of Music, where she teaches four or five hours a week. ‘I think students need a lesson every week,’ she says. The teaching at the Academy is sometimes collaborative: she has shared students with William Bennett and Michael Cox. This, she says, works wonderfully well because although they each have their own methods, the results they are after are along the same lines. ‘However, I love being given a first-year student, knowing it’s my sole responsibility to teach them for four years and equip them for life as a flute player,’ she says. ‘I’m a pretty tough teacher. I cannot tolerate students who don’t work. I believe that every student has to adopt a methodical approach for part or all of his or her studies.’ Is she still learning? ‘Oh, yes, certainly!’ she says. ‘For some reason about three years ago I realised that the same things which were weak about my flute playing when I was back at the Guildhall were still weak now. I wondered if that meant I would go to my deathbed having given my heart and soul to my flute playing with these areas never up to it, really. I had always wondered why grown-up flute players don’t have flute lessons any more. A couple of colleagues said if they were going to have lessons they would go to Robert Winn, so that’s what I did. I went for one lesson and he blew the lid off everything I had ever thought.’ Is Robert Winn’s approach similar to Tom Nyfenger’s? ‘Tom didn’t talk technically or analytically, but Robert is like an X-ray machine—he really is able to look and listen to what is going on. My first lesson with him was a revelation. He had a completely different approach to tone production and breathing than I had ever thought of before.’ I told Karen that few professional players ever think they could do their jobs better than they already do. What makes her different? ‘It’s not fake. I do want to be able to do it all better. I get frustrated at my own inadequacies, whether it’s playing bigger, or smaller, or with greater ease, or to be able to breathe better—you name it. Robert Winn has done me an enormous favour. 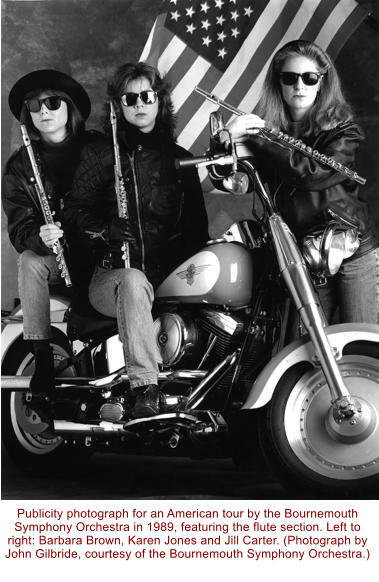 I used to feel so categorically black and white about my approach to flute technique. For the first time I am now really thinking a lot harder about what is best for each student. This is work in progress. I am now thinking about it, whereas in the past I was just reproducing what I was taught. That’s not good enough, is it?’ Is she happy being a freelance? ‘I am proud of where I am and so excited by my diary and the diversity of it. I do feel that I have the pick of the crop.’ Since the beginning of the year, for example, Karen’s work has included playing all the Brandenburgs in Colombia as well as projects with Sting, Thomas Adès and Madonna, and she enjoyed playing at the recent Royal Wedding. This article first appeared in Flute (The Journal of the British Flute Society) in June 2011.